I seriously just finished this book and really you guys: THIS BOOK! How is this book not all over the blogosphere being gushed about or have I just been missing it??? I mean: THIS BOOK! The summary sounded like it would be just my kind of book: paranormal, breaking away from the system, LOVE, high stakes. And it was all I could have wanted from it and more!! What happens to Ruby and all the other kids is heartbreaking in itself and it's SO scary how I can actually imagine something like this happening! And all the adults are so scared of the abilities their kids have developed they actually let the government take them away! I don't want to spoil anything, but what happened with Ruby and her parents tore my heart out. I could feel her scaredness and helplessness as if it had happened to me. And guys, I loved Ruby. She's smart and strong and fierce and loyal and I just loved her. I loved seeing how she grows as a person through her friendship with Suzume, Chubs and Liam and how she learns to trust people again. And can I just say that I loved the whole gang of them? It took me a while to warm up to Chubs, but now I just want to hug his smartass. And Liam! Liam is amazing and wonderful and has a big ol' heroes complex, but I can forgive that cause he's just such a good guy and as you know I have a thing for good guys. And the slow burn romance made my heart happy and I got to the point where I just wanted to scream at them to kiss already and it was kinda perfect. The pace is just right and if I hadn't been crazy busy I would have finished this much earlier, I had to physically tear myself away from the pages or else I wouldn't stop reading. I've seriously missed some sleep cause I just couldn't stop reading this book and I didn't care cause it was just SO GOOD! And again: I don't want to spoil anything but with what happened at the end, Alexandra Bracken left me clutching my heart cause it was being ripped out and stomped on! Seriously! 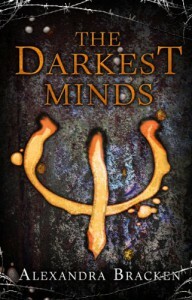 I felt ALL THE THINGS while reading The Darkest Minds and I absolutely love the world Alexandra Bracken has created and all the characters in it (well, maybe not all, but I do love to hate those I do not love) and I cannot wait for book 2! !